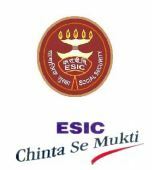 ESIC Hyderabad invites application for the post of 181 Stenographer, Upper Division Clerk & Multi Tasking Staff. Apply Online before 06 Jan2016. For Stenographer : Higher Secondary pass (pass in 12th standard or equivalent from a recognized board). A speed of 80 words per minute in stenography in English/Hindi. Working knowledge of Computer including use of Office Suites and databases. For Upper Division Clerk : Degree of a recognized University or equivalent. Working knowledge of Computer including use of Office Suites and databases. For Multi Tasking Staff : Matriculation or equivalent pass. Selection Process : Selection will be made on Written Exam, Stenography Test & Computer Skill Test. Application Fee : Candidates belonging General/OBC have to pay Rs. 300/- through Challan. candidates belonging SC/ST/PWD/Ex-servicemen/Women are Exempted from payment of fee. How to Apply : Interested candidates may apply Online through website http://www.esicmaharashtra.gov.in from 07.12.2015 to 06.01.2016.